In these days where so many people have made-up names, I wonder what really constitutes an unusual name anymore. We live in a really ethnically mixed world and deal with folks with names that don’t necessarily roll off our tongues. I know, growing up in Tennessee, I never expected to meet the Polish and Slavic names I found when we moved to Pittsburgh. Now, I work with people from around the world and encounter lots of “unusual” names. I talked before about one of the more unusual names in my line – Otway Lycipious Bailey and Zenas Ignatious Tennison. Never have quite figured out where those came from. In my family, you can find all of those good Old Testament and New Testament names. Along with Aaron, Abel, and Abraham, you find Ebenezer, Eunice, Hephzibah, Vashti, and Micajah. Sometimes you have to wonder whether the parents actually read the Scripture, or whether they just figured it was a good Bible name. There are several folks with Puritan-style virtue names – Charity, Experience, Patience, Constant, Honore, Hope, and Mercy for some. These seem to have gotten a start in the Great Migration, but they carry on for generations. There are folks named after famous people – George Washington, Thomas Jefferson, and even Marcus D. Lafayette. (Marquis de Lafayette – for real! And they have no name to go with the D. and they were called Marcus!) There’s a Fernando Cortes (in Arkansas) and a Christopher Columbus (called Lum). I have a number of folks named after places – Tennessee, Texanna, Virginia, Carolina (and even Virginia Carolina!). There’s an Augustine Florida and an Augusta Carolina, a Georgia Augusta, and a Savannah Georgia. Seems like the women are more frequently named after places than the men in my family. One man in my family had not so much an unusual name as an unusual coincidence of names. 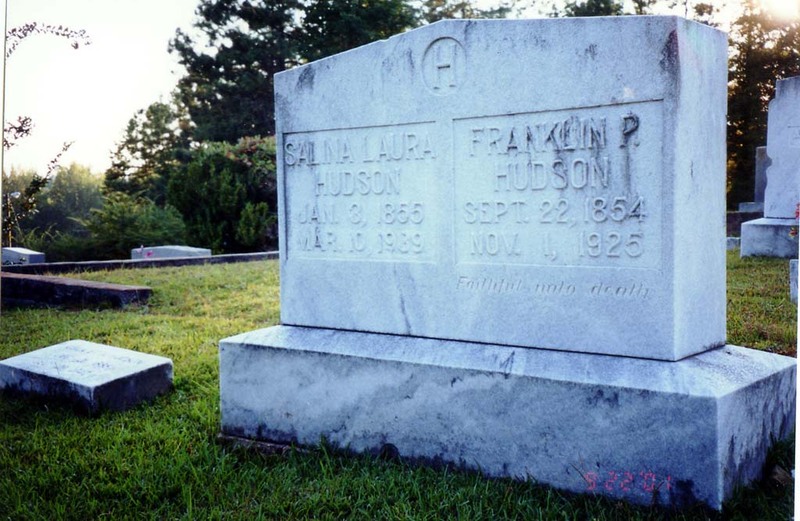 Benjamin Franklin Pierce Hudson was born 22 Dec 1854 in Fulton County, Georgia to Wesley Hudson and Elizabeth Landers. He was the 10th of their 13 children. I’ve spent years working on trying to find the families of Wesley and Betsy with no real luck. And among their children, I’ve really spent most of my time on their son John Wesley Hudson, my great-great-grandfather, who moved from Georgia to Arkansas after the Civil War. I thought that maybe there was another Benjamin Franklin Pierce for whom Dock Hudson was named. I suspect that if there were, he was a family friend. He had brother named Silas Norton Hudson, named I suppose for the neighbor and associate Silas Norton who lived nearby. But, I’ve not found one yet. I guess I might look a little harder. Maybe he was named for President Franklin Pierce, who became president in 1853, just a year before B.F.P. Hudson was born. Benjamin Franklin Pierce Hudson often went by the nickname “Dock”. That’s pretty coincidental, since his namesake, years later, was a famous doctor of sorts. Do you remember watching M.A.S.H. during the 1970’s? What was Hawkeye’s real name? Dr. Benjamin Franklin Pierce! I thought this was a funny coincidence as I was reviewing my family groups. Dock Hudson, like I said, was born in 1854 in what would now be called Midtown Atlanta. Wesley and Betsy owned over 350 acres there before the Civil War. When the war broke out, they moved west to Dallas in Paulding County and lived along Pumpkinvine Creek. If they were trying to escape the war, they didn’t do very well. Pumpkinvine Creek was the scene of some major fighting during the battle for Atlanta in 1864. Dock married Salina Laura Adair on 11 Dec 1873 in Paulding County, Georgia. She was the daughter of William Levi Adair and Adaline Gann. For any of my Arkansas Hudson family, you will recognize the Gann name. The Hudsons and the Ganns were thick even back in Georgia. John Wesley Hudson and John William Gann were best of friends in Georgia and in Arkansas. The two families have cemeteries less than a quarter mile from each other, on Gann Cemetery Rd and Lane Cemetery Rd, near the Pumpkinvine Baptist Church outside Dallas, Georgia. Dock was a prominent businessman in Dallas. He as elected to the Ordinary Court in 1896. The 1910 Census shows him as bookkeeper for the court. He died in 1925 and Laura died in 1939. Both of them are buried, along with several of their children, in the Dallas City Cemetery, right on the main avenue as you pull into the cemetery. A place of prominence. He and Laura had seven children, six of whom lived to adulthood. The last of his children died in 1994. I wonder if Ethel Hudson saw the coincidence that the main character in one of the most popular television shows of the 1970s shared a name with her father, “Doc” Benjamin Franklin Pierce Hudson. When my great-grandparents, Sam Scott Wren and Pearl Hudson were married in 1899, Sam’s parents gave them a clock as a wedding present. It was a Welch kitchen clock, about 24 inches tall and 15 inches across, designed to sit on a shelf. And it did. For years and years, it sat in Sam and Pearl’s house, dutifully chiming the hours and the half. I don’t actually remember it being in their house by the time I came along, but I was not really aware of the details, or at least I was focused on other details. Dr. Alonzo Dossey Wren (Dr. Wren) and Georgia Frances Vickers came to southwest Arkansas the long way around. He was born in Putnam County, Georgia in 1841, she in Thomas County, Georgia in 1849. By the early 1850s, both of their families had migrated to the Minden area in Bienville Parish, Louisiana. That’s where they were married in 1866, after he returned from the Civil War. He studied medicine at the University of Louisiana Medical Department, now Tulane University, in New Orleans. Then the family made its way to southwest Arkansas, Nevada County where they raised their family. Pearl’s family came to Nevada County from the Atlanta area. Her father was John Wesley Hudson, born in the Atlanta area in 1841, right at the founding of Atlanta, but that’s another story for another day. Her mother was Millie Lucinda “Cindy” Almand. Cindy was from the Conyers area in Rockdale County, Georgia where her family had been some of the founding families in the Salem Camp Meeting. Generations of Almands still meet there every September for a reunion – 2nd Sunday in September at 1:00PM. Bring a dish and you’re more than welcome! Both of these families had moved into Paulding County, Georgia after the Civil War, but I can’t find any evidence that they knew one another, or that they didn’t. In any case, there was a large migration from Paulding County, Georgia to Nevada County, Arkansas around 1870. Sam Scott Wren was born in Nevada County in 1879 and Pearl Hudson was born there in 1884. They were married in 1899 and her parents wanted to give them a significant gift for their wedding. So, the clock. A.D. and Georgia Wren gave the newlyweds a beautiful Welch kitchen clock. It must have broken at some point. I don’t remember it in Grannie’s (Pearl Hudson Wren) house. I do remember that my uncle Keith Johnson refinished it and gave it to Papaw (Hudson Wren, my grandfather) one year. And I can always remember it in Nannie and Papaw’s house, sitting near the fireplace in the living room. I remember thinking how loud it was when it ticked and chimed. But then, it faded into the background and you would have to listen hard to see if it was running. I remember hearing it chime once in the night and then not knowing if it was 1:00 or 1:30 or what time until the next chime, thirty minutes later. After my grandparents died, Mom asked me what I would like to have from their house and I said the clock. I think she was sort of reluctant at first to let me have it, it being so special. But, she did. And I have loved it. It sits in my office and gets wound every Sunday. Kathleen doesn’t want to wind it but doesn’t want me to forget, so she gets the key out of the clock and sets it on my chair so I never forget to wind it. I have had it worked on a couple of times – cleaning, bushings replaced, a new spring – but it’s the same clock that has kept on ticking since it found its new home with Sam and Pearl in 1899. The last time I had it cleaned, I slipped coming down the stairs and broke my foot, but the clock didn’t get dropped and kept on running. Interestingly, I went ahead and took it to the clock repair place. I got a call to pick it up the day my foot came out of the cast. So, if you are on a conference call with me and hear it in the background, and if I am working at home, you probably will hear it, now you know its story.